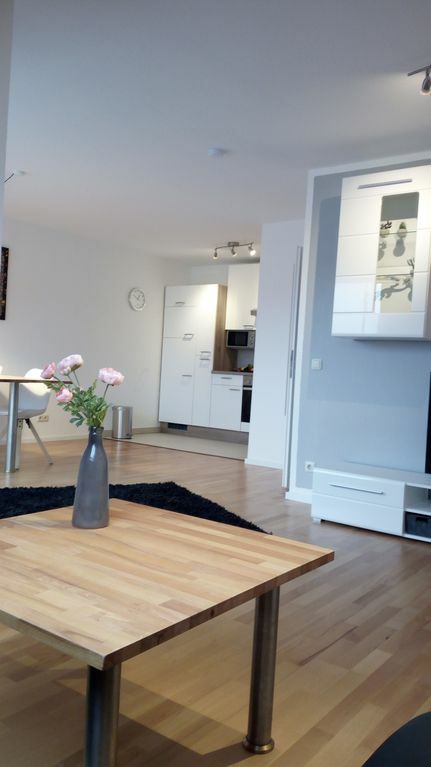 Newly renovated and renovated apartment with logia in the south of Münster. Spacious L-shaped room where living area, dining area and kitchen were housed. The kitchen has a fridge with freezer, cooker with ceramic hob and oven. Microwave and dishwasher. A coffee pad machine, toaster and kettle are also available. The large bedroom with double bed and wardrobe is accessible via a space-saving staircase. The bathroom is inside and has a shower. The balcony looks directly onto an old farm and horse pastures. The sister house of the Heart of Jesus Hospital is partially visible. 4.5% tourist tax (bed tax) to the city of Münster, the apartment is needed because of professional residence, an exemption is possible. Parking (double parking) in underground parking can be booked for 3.00 € / day. It can be parked there only small cars. It is possible to decide on the spot whether the parking lot should be taken. Ich habe ein wunderbares Wochenende hier verbracht und mir von da aus Münster angeguckt. Die Vermieter sind nett und verlässlich. In der Wohnung ist alles notwendige schon enthalten (Öl zum kochen, Salz, Pfeffer) und ansonsten ist ein Supermarkt und ein Bäcker zu Fuß gut erreichbar. Sie ist außerdem schön und gemütlich eingerichtet.